“How do you know you don’t like if you don’t know what it is?” I would ask. “I don’t like it!” they would repeat it. When my mother would respond to my niece’s “not sure” as if she was indecisive, a real battle of the wills would ensue. When we responded to our children’s “I don’t like it” as if it were only a complaint, we’d get the same thing. On the other hand, if we responded to it as an explanation of their need for more learning, we might get a different result. Don’t get me wrong! Very often “I don’t like it” was exactly what they meant and no amount of additional data, no persuasion would change that. But I’ll tell you this . . . our kids very early on learned to like broccoli, so occasionally we must have done something right. I thought of these childish miscommunications as I pondered further our month-long liturgical contemplation of bread. Last week, you recall, our reading from the Old Testament was the story of God providing the “bread from heaven” to the Hebrews in the wilderness of Sinai, something the Hebrews called manna. Actually, they didn’t call it that. What they did was declare their ignorance of something they were unfamiliar with, something with which they had no experience, something they didn’t understand. They asked, in Hebrew, Mawnə? Or, in English, “What is it?” Can’t you just hear the follow up: “What is it? We don’t like it”? So here we have a biblical image, the metaphor of bread, presented in three different stories which share a similar context, the context of complaint: the bread of heaven accompanied by the childish complaint of ignorance, “Mawnə (What is it)?” – the angel-provided hot cakes accompanying Elijah’s childishly stubborn complaint, “I should just die” – the “living bread” of Jesus met with the complaints of the Jewish leaders. When we encounter a biblical metaphor so closely connected with such a context, we have to ask, “Why?” We have to explore the metaphor in depth to suss out its meaning and how it applies to the context. So what do we know about bread? One thing we know about it is that it is a universal human food. Some form of bread is known in every human culture. It is a staple of human nutrition. We also know that, whatever cultural differences in the preparation there may be, all bread is essentially the same. It is a simple food made from the seeds of one or more species of grass, ground into flour, mixed with liquid, worked into a dough, and baked. There’s really not much more to it than that. Nonetheless, despite its simplicity, it takes a recipe; that’s the third thing we know. As anyone schooled in cuisine knows, cooking is 10% art and 90% chemistry. Recipes are to cooks and bakers what formulas are to chemists – disciplined instructions for a consistent result. A really experienced baker can vary the ingredients, but each ingredient must be there in some form. In a recipe for bread or any other dish, every ingredient serves one or more specific purposes, from generating gases to creating glutens to binding other ingredients together. Eliminating any of the essential ingredients of a bread recipe also removes the chemistry behind it; without that ingredient you will get something, but it won’t be bread. The recipe also lays out the sequence of steps that you must follow to bake bread; they must be done in the order set. Try to do them in a different order and, again, you don’t get bread. In a word, the recipe disciplines the baker so that the baker makes bread. If you’ve ever baked your own bread, a fourth thing you know is that making it is time consuming. You can’t get it done in a few minutes. 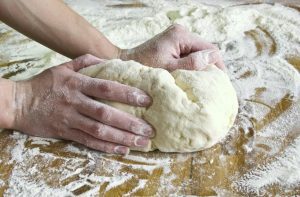 Following the recipe, measuring ingredients, combining them into a dough, kneading it, letting it rise, punching it down, kneading again, forming the loaves, allowing it to proof, and then that painfully impatient hour during which it bakes and the house fills with the delicious smell of the bread you can’t yet eat. Making bread takes time. There is a great TED talk by a baker named Peter Reinhart entitled The Art and Craft of Bread Baking in which Mr. Reinhart lays out no fewer than twelve time-consuming stages in the bread baking process. I won’t repeat his talk today, but I encourage you to look it up and view it; it’s very good. What I do want to take from Mr. Reinhart’s talk is a fifth thing about bread, something we know but may not have fully appreciated. This fifth thing is that the making of bread is a process of transformation. As Reinhart describes it, it is a series of transformations from living grain, through the death of drying and grinding into flour, into new life as the flour is combined with water and yeast into a dough that grows, through death again as the loaves are baked and yeast is killed in the heat, into life again as the bread is served and consumed as nutrition. So . . . these five things we know about bread: it’s universal; it’s simple; it takes discipline; it takes time; and it embodies transformation. What does this say to us about complaining? Well, let me make just a few suggestions. The sun rises and the sun goes down, and hurries to the place where it rises. The wind blows to the south, and goes around to the north; round and round goes the wind, and on its circuits the wind returns. All streams run to the sea, but the sea is not full; to the place where the streams flow, there they continue to flow. All things are wearisome; more than one can express; the eye is not satisfied with seeing, or the ear filled with hearing. What has been is what will be, and what has been done is what will be done; there is nothing new under the sun. Is there a thing of which it is said, “See, this is new”? It has already been, in the ages before us. Most of what we complain about, if not all of it, has been experienced by someone before us. Whatever problems we may have, they are very likely not unique to us. Others have been here before, and will be again. Instead of complaining as if we were the only ones ever to have had this issue, perhaps we should recognize the commonplace in our complaints and seek the advice of those who have been through this, whatever it is, already. [T]he Buddhists figured this out before most of us. The “first noble truth” of Buddhism is often translated as “life is suffering”, but that’s a bit melodramatic; it implies constant agony, when for most of us that’s thankfully rare. The word in question, dukkha, means something closer to “unsatisfactoriness”. Life can be wonderful, awful or somewhere in between, but there’s always an undertow of not-quite-right-ness: either what’s happening is unpleasant, or it’s pleasant but you know it must end. . . . One big Buddhist insight is that this dissatisfaction doesn’t arise from our circumstances themselves, but from the way we try to attain happiness, by lining up our circumstances just right, then keeping them fixed in place for good. It’s a quest that’s doomed to fail, since nothing lasts. [God] makes his sun rise on the evil and on the good, and sends rain on the righteous and on the unrighteous. . . . [So] do not worry, saying, “What will we eat?” or “What will we drink?” or “What will we wear?” . . . [Y]our heavenly Father knows that you need all these things. But strive first for the kingdom of God and his righteousness, and all these things will be given to you as well. Life on a sailboat has required me to think about what I actually need to be happy in life. Simplifying your life will give you more time, space, and energy. The more space you have, the freer you’ll be to truly enjoy everything. And if one is truly enjoying life, one will have much less to complain about. Putting away falsehood, let all of us speak the truth to our neighbors, for we are members of one another. . . . Let no evil talk come out of your mouths, but only what is useful for building up, as there is need, so that your words may give grace to those who hear. . . . Put away from you all bitterness and wrath and anger and wrangling and slander, together with all malice, and be kind to one another, tenderhearted, forgiving one another, as God in Christ has forgiven you. Therefore be imitators of God, as beloved children, and live in love . . . .
We are to be disciples, that is, those who follow the discipline of Christ as a baker would follow the recipe for bread. The fourth thing we remembered about bread is that making it takes time; learning not to complain also takes time. It’s easy to say “Let go and let God,” but I find myself constantly snatching back the things I give to God. “Here God,” I say, “you handle this,” and then I immediately start giving God advice on how to do so and when God doesn’t handle it the way I expected, I step and start try to take over and I complicate things. It’s easy to say, “Simplify” and it’s damned hard to actually do it. I’ve been saying for months that Evie and I need to begin decluttering, and we make a start at it every few weeks, but . . . Oh, my! Making the decisions about what to get rid of and what to keep! What a time consuming process! It’s easy to say, “Discipline,” but the disciplined life of a Christian only develops over time. Developing a habit of not complaining is the work of a life time! But . . . over time, as we give up the illusion of uniqueness and recognize, instead, the universality of the human condition, remembering the Christian truth that Christ died once for all . . . symbolized by the universality of bread . . .
. . . as we simplify our lives remembering the simple truth that “God is love, and those who abide in love abide in God, and God abides in them” . . . a truth symbolized by the simplicity of bread . . .
. . . as we follow the recipe for living with one another given by Paul in today’s epistle lesson, as we follow the Law as summarized by Jesus – Love God and love your neighbor – as we might follow a recipe for baking bread . . .
As certainly as my niece learned to say “Surely not!” rather than “Not sure” and as surely as my children learned to say “I need to learn about this” instead of “I don’t like this,” as we incorporate the lessons of bread, of “the living bread that came down from heaven,” into our lives, we will learn not to complain, but to rejoice because “whoever eats of this bread will live forever.” Amen. This homily was offered by the Rev. Dr. C. Eric Funston on the Twelfth Sunday after Pentecost, August 12, 2018, to the people of St. Paul’s Episcopal Church, Medina, Ohio, where Fr. Funston is rector. The lessons used for the service are 1 Kings 19:4-8; Psalm 34:1-8; Ephesians 4:25-5:2; and St. John 6:35, 41-51. These lessons can be found at The Lectionary Page.